"The one thing that has always remained the same at Niobrara Valley Hospital is that healthcare is right here, close to family and friends, offering you the healing power of personal attention because here you are treated like family." Niobrara Valley Hospital has been serving Boyd County and the surrounding area since 1971. We are a 20 bed Critical Access Hospital that offers a wide variety of hospital services for Health and Wellness needs. NVH hosts specialty physicians who provide highly-specialized services to meet your health care needs on a regular basis. A 7 member board consisting of community leaders from around the area makes up the Niobrara Valley Hospital Foundation. Together they direct fund raising activities to benefit health care in Boyd County and its surrounding areas. Did you know that you can play a role in making sure that future generations have a local option for health care? Consider a gift to Niobrara Valley Hospital Foundation, your tax deductible donation ensures that the hospital will continue to provide high quality health care to patients right here at home. There are many ways you can give: cash, securities, bequests, gift annuities and trusts, life insurance and property. Niobrara Valley Hospital has also partnered with Faith Regional Health Services to offer Charitable Estate Planning through Thompson & Associates free of charge to you. The general hospital built by Dr. Ira and Dr. Kriz. 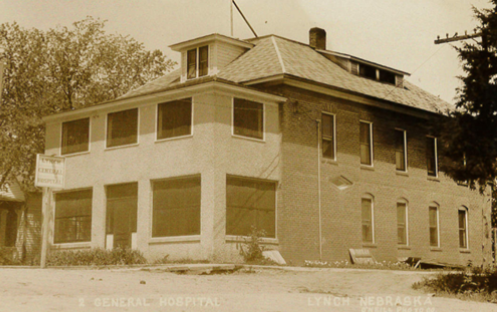 Today, Niobrara Valley Hospital is the only hospital operating in Lynch, Nebraska, but it certainly wasn’t the first, or even the second, to be built in the little town. The original hospital, named Sacred Heart Hospital of Boyd County, was built in 1920 and still stands today! It was staffed by the Sisters from St. Vincents Hospital in Sioux City Iowa, and run by Dr. Martin from the Mayo Clinic in Rochester. However, shortly after the opening of the Sacred Heart Hospital it closed due to financial issues. Soon after, two local doctors, Dr. Ira and Dr. Kriz, began construction on a large building in another section of town that would become a new general hospital. 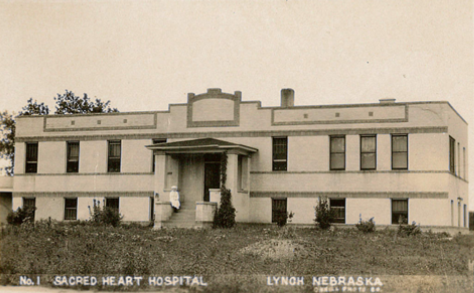 This became the second of three hospitals built in the small town of Lynch, Nebraska. The Sacred Heart Hospital built in 1920. ​On March 22, 1924, Benedictine Nuns bought the abandoned Sacred Heart Hospital for $15,000 and in only eight weeks the hospital was open for business once again. The newly reopened hospital was run by Dr. Venneman who worked alone until he retired in 1929. The nuns extended an offer to Drs. Ira and Kriz to practice in their facility to which the doctors graciously accepted and closed their own general hospital for good. The Sacred Heart hospital continued to flourish in the small community and in 1941 a new wing was built on the north side of the building. This new wing was set to include a chapel, maternity ward and several private rooms for the nuns. Several years later another expansion was added to the west side of the building which made room for patient rooms on the first floor and Sisters quarters on the ground level. The Sacred Heart Hospital continued to run until 1971, when new fire codes and regulations required the need for a new building. The new hospital was built just west of the old building and is today known as the Niobrara Valley Hospital. The nuns continued to run the new hospital until 1980, when the last nuns retired, the Board of Directors hired an all new staff to keep the place running. In 1994, wheels were set in motion for an addition to be added to the building that would provide for new office spaces, medical record storage, a conference room, central supply storage, laundry, physical therapy, cardiac rehab and a new lobby. The re-dedication of the remodeled facility was held in September of 1995. In the same year Niobrara Valley Hospital was included as one of the Thomson Reuters 100 Top Hospitals, which evaluates short-term, acute-care, non-federal, U.S. hospitals across 10 different categories. In 1999, NVH became a Critical Access Hospital. A CAT Scan and new x-ray equipment were added to the services that the hospital had to offer in 2004. Several years later in 2010, the radiology department upgraded to a film-less x-ray system and in 2015 they were proud to announce the addition of a new 64-slice CAT Scan. As of April 2011, Niobrara Valley Hospital became an affiliate of Faith Regional Health Services and has continued to make quality improvements that have included the addition of electronic medical records along with an update of cardiac telemetry, update of surgical scope, recruiting and outreach capabilities and the ability to use teletrauma medicine in the ER.